Ever tried slicing a piece of meat or chopping some vegetables with a dull knife? If you have, I’m sure you noticed how hard it was to penetrate the surface of the ingredient. Dulled out knives aren’t just a hassle to cook with, but can be really hazardous to use as well. In fact, there are more occurrences of cutting accidents that happen with dull knives than with sharp edged ones. This is why it’s important to get a nice piece of cutlery that doesn’t easily get dull and can be sharpened without much effort. When looking for such knives, I can’t help but think about a certain brand, the Sabatier. 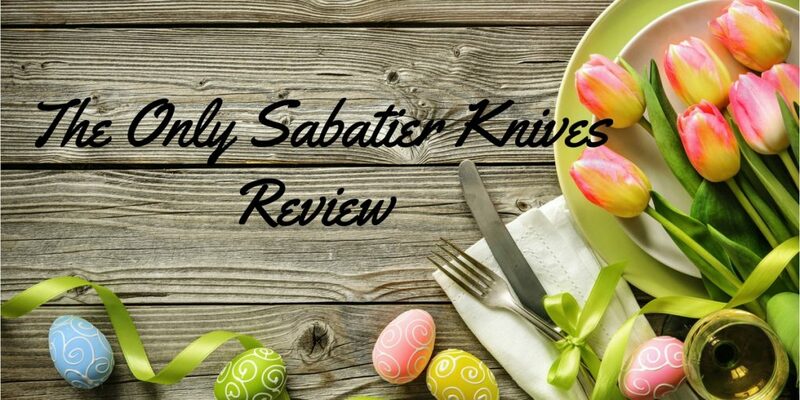 If you are currently looking for a new cutlery set or a new knife for your kitchen, I highly suggest checking out the knives under the Sabatier brand. Don’t know a thing about Sabatier knives? Read on and find out all you need to know in this Sabatier knives review article I have prepared below. Sabatier is a well-known French brand in the cutlery world. 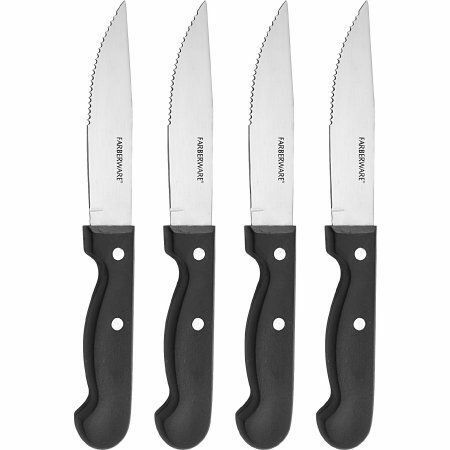 This brand has become known for producing highly durable knives made with carbon steel. Being made with such a piece of material, knives under the Sabatier brand tend to be very sturdy and sharp-edged. What’s great about Sabatier knives is that you can get them customized. Can you imagine a cutlery set with your last name etched on the blades edges? Pretty cool right? 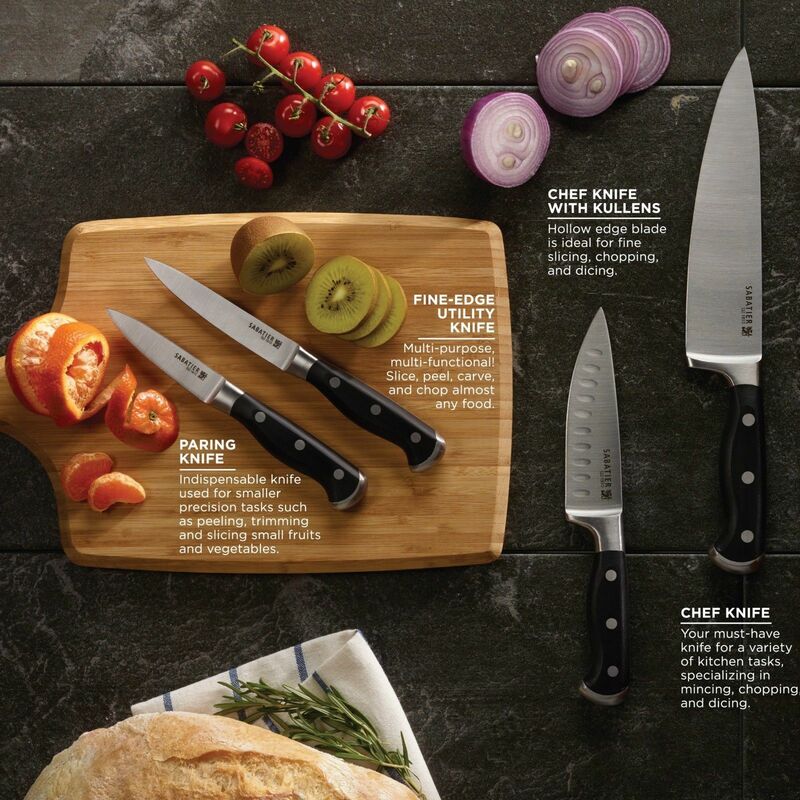 Sabatier offers a large selection of knives from all-around chef’s knives, filet knives, santoku knives, steak knives, utility knives, you name it. Though Sabatier knives are very sturdy and can last you years, they still need to be properly maintained to for added longevity. After using your Sabatier knife, always see to it that it gets cleaned after every use. After washing it with soap and water, wipe the knife with a clean cloth to ensure that it’s thoroughly dry. As with any type of object you wish to purchase, it’s always a good idea to have a set of factors to review before you shell out your hard earned cash. Here are a couple of things you should consider before getting a knife or a set of knives. Do not refrain from checking these factors out because going over these can significantly help you become a happy and satisfied customer. 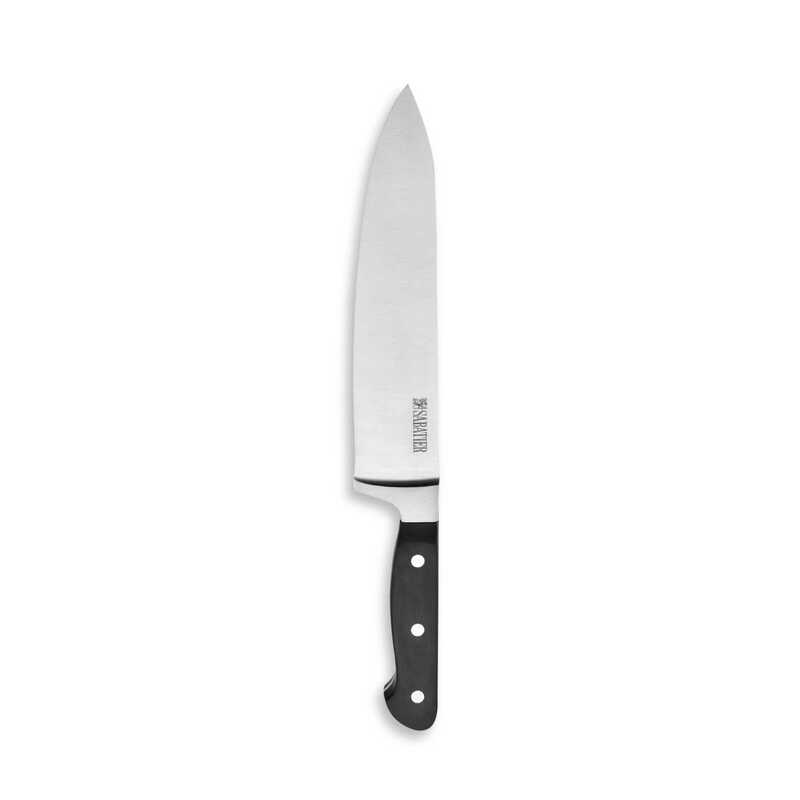 ​A knife’s blade can come with a plain edge, serrated edge, and a micro-serrated edge. Though you may think that there’s very little difference between these three blades, you shouldn’t get fooled into thinking that the type of blade on your knife can’t affect the way you cut, slice, or chop your ingredients. 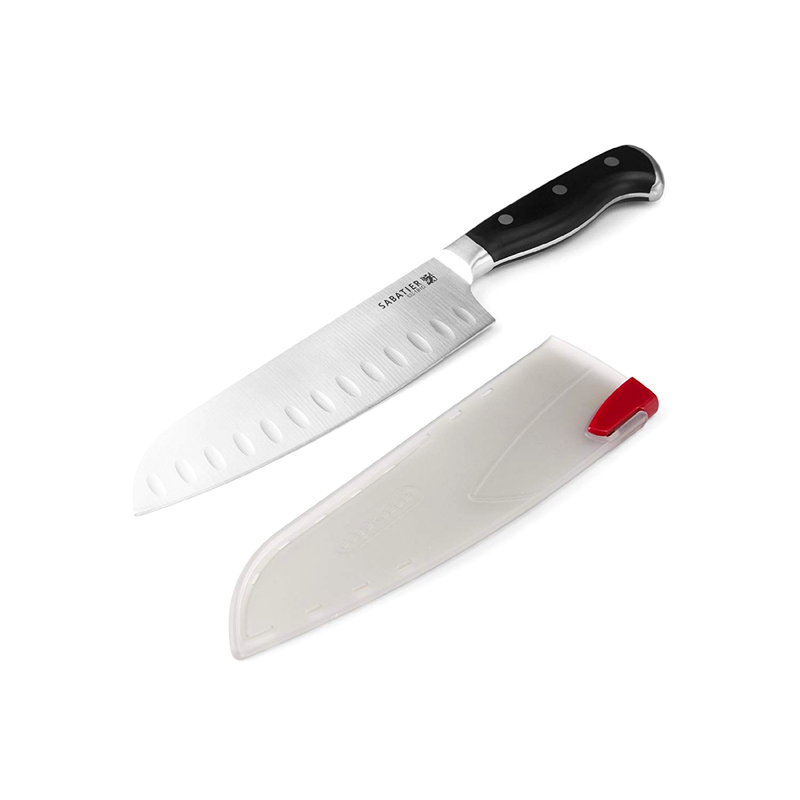 Simply keep in mind that plain edged knives are the ideal choice for slicing fragile ingredients such as fish. It’s also the ideal choice for peeling tough skinned fruits such as tomatoes. Serrated knives on the other hand are the ideal choice for carving meat and slicing thick and dense chunks of food. As for micro-serrated knives, they can be used for all sorts of cutting and slicing, but I personally think that they work best for dining. There’s a plethora of knives that you can find in the market today. Some knives can be used for cutting, chopping and slicing, while others serve a more singular purpose such as opening stubborn clam shells. Before you buy a piece of cutlery, make sure that it fits the purpose you are thinking of using if for. Try to choose a knife that can offer you with enough balance to perfectly maneuver it when cutting, chopping, or slicing any kind of ingredient. The way to find the balance of a knife is through the design of its handle. Make sure that the knife you are planning to get comes with a handle that’s easy and comfortable to grip, especially if you are planning on using it for a long period of time. Knives can come with different types of accessories such as seathes, chopping boards, whetstones, sears, knife blocks, and even honing rods. Though I don’t really suggest basing your purchase on the free gifts that come with the product, it’s still nice to consider how much you are getting for the price of a single knife. One factor that you should never forget to consider is the ease of maintenance and cleaning. Try to choose a piece of cutlery that requires minimal effort to clean and maintain. This could mean going with a piece or set that’s dishwasher safe and rust-proof. 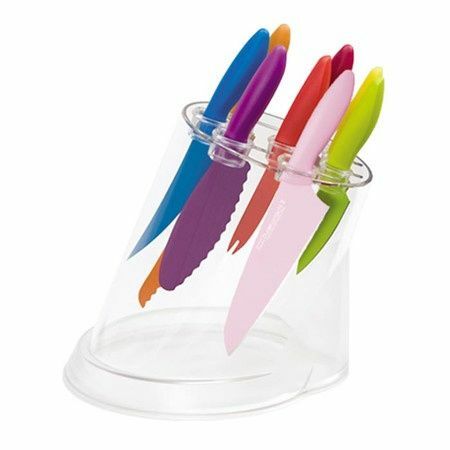 This knife set is the ideal choice for those looking for a complete cutlery set to add to their kitchen. This set includes a knife block, six steak knives, a paring knife, a utility knife, a slicer knife, and two all-around chef’s knifes. What more could you ask for right? This 10-inch chef’s knife can cost you a couple of bucks, but it’ll be surely worth every penny since it’s made with authentic carbon steel that will surely last you for years to come. This piece of cutlery is made in the legitimate Sabatier factory in Thiers, making it a truly remarkable knife that doesn’t only have an attractive look, but has quality performance as well. 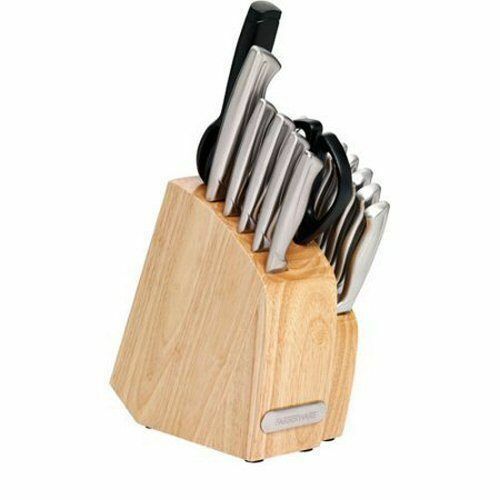 This 15-piece knife set is one of the two Sabatier knife sets I have included in this list. 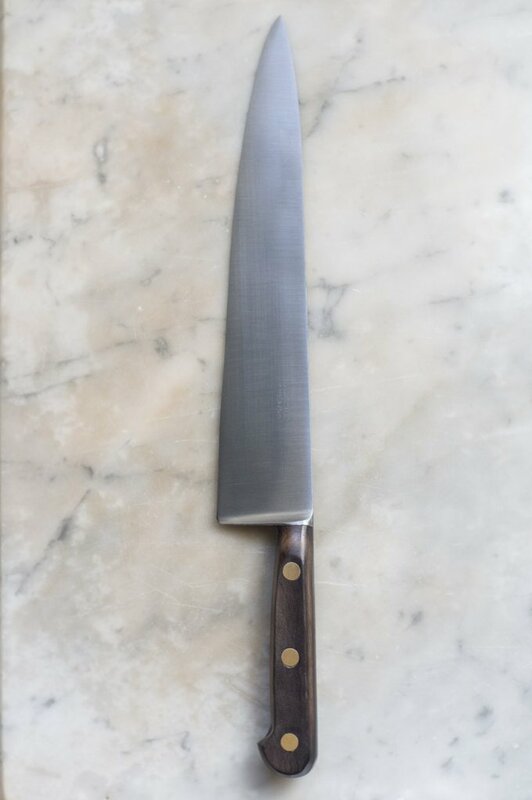 This one comes with six steak knives, a paring knife, a fine edge utility knife, a serrated utility knife, a santoku knife, a slicer, and a chef’s knife. Every knife included in this set is made with high quality carbon steel that’s not only stainless, but rust-proof as well. Needless to say, the knives in this set will surely last you years provided that you properly maintain them. This 8-inch chef’s knife is ultimately the ideal choice for any home cook who is looking for a fine knife for cutting, chopping, and slicing a variety of ingredients including meat, vegetables, and fruits. ​What’s great about this knife is that it’s made out of high carbon steel that’s not only durable, but keeps its sharp-edge for a long period of time. What’s more is that it comes with a nice seathe that has a built in sharpener for maintaining the blade’s sharp edge. This santoku knife comes with a very classic looking design that can make it easily fit your existing cutlery set at home. What I like about this knife is how easy it is to use for chopping vegetables and for slicing tough skinned fruits such as tomatoes. 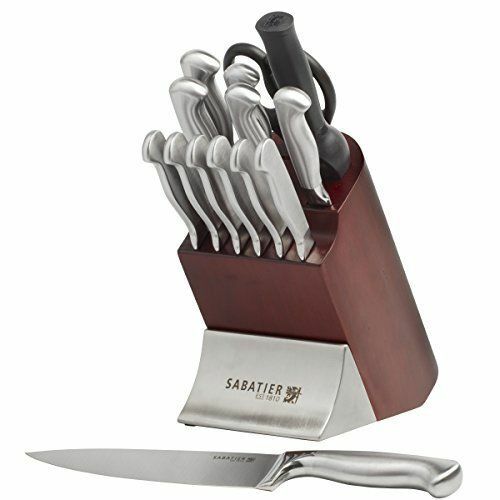 The Sabatier Self-Sharpening Edgekeeper Pro 12-Piece Forged Triple Rivet Knife Block Set is surely a great choice for any home cook who is looking for a fine knife set. What made me suggest this knife set is it’s complete selection of knives that are made out of high carbon steel, stainless, and not susceptible to rust. I also favored this set because it comes with a knife block that has a built in sharpener for easier maintenance in the long run.